Talocan is the most gravity-defying spectacle. 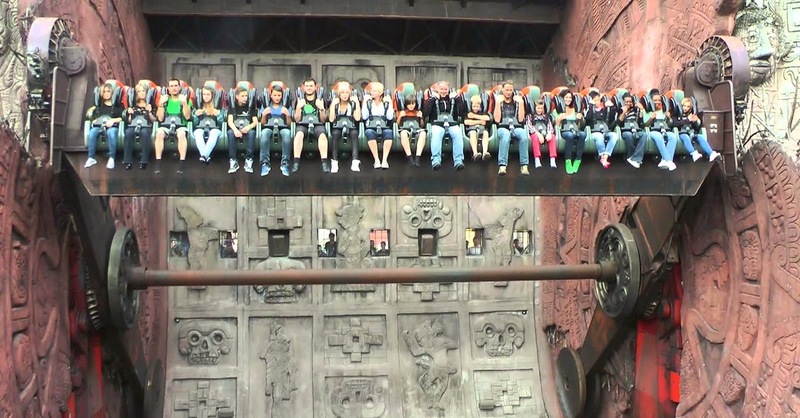 The ride, which is located in Germany’s amusement park Phantasialand, takes everyone on a thrilling experience, leaving them disoriented as they spin round and round. What’s more exilarating is that the ride has swirling mists, jets of water and bursts of flames shooting around them! Just watching it is enough to take your breath away! The amusement park ride was inspired by Tlaloc, Aztec God of the forefathers, who lashes out with thunder, lightning and rain. “Hungrily, he waits for fresh victims, ready to face the challenge of his Talocan lair,” the park describes the thrill ride. Whoa! Would you be brave enough to go on this ride? Tell us, and please SHARE this video with everyone you know.